There are many components to an AR-15 rifle, and a lot of attention is placed on selecting the best options or configuration for essential parts such as bolts, sights, stocks, and handguards. But one component, the magazine, is an important part that shouldn't be overlooked. As such a vital component for reliable operation of a semi-automatic weapon, quality and durability are must-have features in a magazine. Del-Ton, Incorporated (DTI) offers quality AR-15 magazines from a number of different manufacturers. In the AR-15 marketplace, there are plenty of available choices...selecting which one is right for you, like all choices you will make in the configuration of your AR-15 rifle, comes down to application (how you will use your weapon). Magazine capacity is one thing to consider. Certain states and even some cities or municipalities have legal restrictions on magazine capacity, so it is important to know what the laws are where you reside. But it is also important to consider how magazine capacity and size will affect your application. The 30 round magazine is popular with many AR-15 owners, but state hunting regulations may prevent you from hunting with an AR-15 rifle that has a magazine over a certain capacity. Even where it may be legal, most people would not want to be carrying a fully loaded 30 round magazine in the woods all day. If you plan to use your AR-15 for target shooting from a bench, even just for sighting in, a magazine with reduced capacity/overall size would be a more functional selection in this application as well. A similar scenario where a shorter magazine can be beneficial is when shooting from the prone position; a 10 or 20 round magazine will allow you to remain close to the ground without having to cant your rifle. In summary, it is important to know your application (how you will primarily use your weapon, most of the time) when selecting which magazines to use with your AR-15. 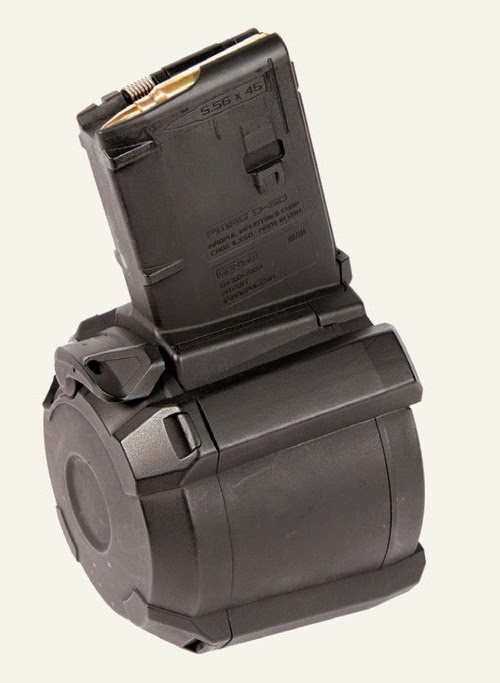 Del-Ton currently offers AR-15 magazines in 10, 20, 30, and 40 round capacities. The 60 round Magpul D60 is scheduled to be available during the summer of 2015. Magazine construction is another thing to keep in mind. Metal (aluminum and stainless steel) magazines are durable and have a proven track record with this platform, but there are many durable polymer magazines as well. Metal magazines have a very slim profile and fit well in magazine pouches that hold multiple magazines. 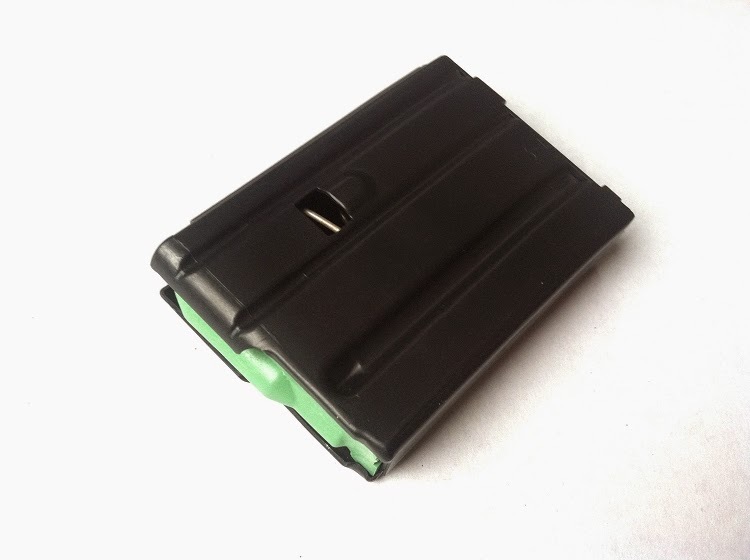 Many polymer magazines have a floor plate that is wider than those of metal magazines, and this can cause them to "fan out" and not fit as well when stacked together in such a manner. 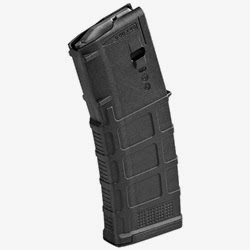 The polymer Magpul GEN 3 PMAG has a slimmer floor plate than most polymer magazines, and the Troy Battlemag has an extremely slim body and flush floor plate; manufacturers and innovation/product design have begun to make things more equal in this regard. Metal magazines are usually black or grey, but polymer magazines are available in other colors like flat dark earth or olive drab green. This may seem like a purely cosmetic feature, but in a hunting or military/LE application it can be a feature that is of some importance. Most modern magazines of metal or polymer construction feature no tilt followers and quality springs. Accessories like mag couplers and pull tabs that either attach to or replace the floor plates are available for both styles of magazines as well. There are many things to consider when deciding which magazine is best for your particular application, but quality, durability, and dependability should be your first priorities. As stated earlier, this is an essential and important part in a functioning AR-15 rifle. DTI offers quality aluminum magazines from popular manufacturers like D&H, and only the best polymer magazines from leaders in the AR-15 industry like Magpul and Troy Industries. When selecting parts for or planning the configuration of your AR-15 rifle, don't overlook the importance of this essential component. Research which brand and model will best fit your shooting style, and objectively read plenty of customer reviews on a particular magazine before a final decision. 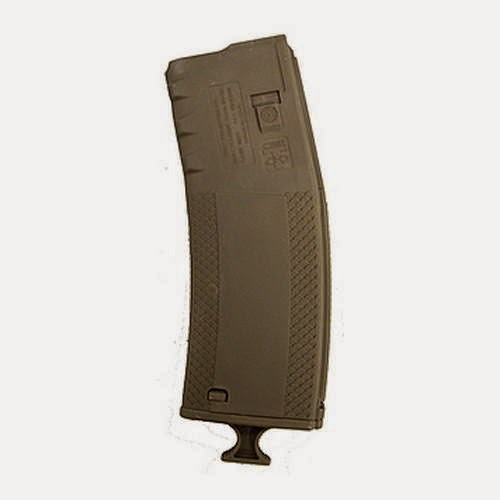 If you have any questions about AR-15 magazines, the AR-15 rifles we manufacture at DTI, or parts we offer at www.del-ton.com, please feel free to contact us. The only 'places' where I ever saw the gun magazines - are the games. I'm highly against the guns in the free access. I think it's a really bad idea, no matter what the people say. In one of the reviews on MyPaperWriter I saw a lot of ideas that were against guns.